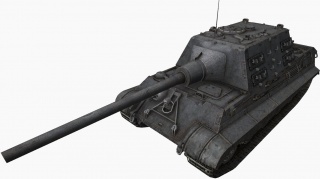 The Jagdtiger is a German tier 9 tank destroyer. 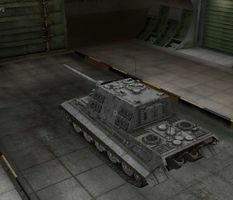 The undisputed "King" of German tank destroyers before the 7.5 update, and by some still considered to be better than the Jagdpanzer E-100, the Jagdtiger offers thick frontal armor and a selection of two heavy guns capable of dealing massive damage to any target. Due to its high weight, it is slow and unwieldy. The gun mantlet, while thick, shots which hit it still manages to damage the gun. If de-tracked, or attacked from the rear or sides, it will die easily and quickly . Do not approach this tank from the front even if you have a gun with sufficient penetration; it will probably be the last thing you see before becoming a smoking wreck. This tank destroyer is best played with one or two mediums acting in support role, defending its sides and rear. It has large weak spots, as with most German tanks, on the lower glacis plate. There are several places with guaranteed penetration, but those are yours to find. Either way, drive or attack this tank destroyer with caution. Note that the Jagdtiger in World of Tanks is the Henschel version with 9 wheels on each tracks. 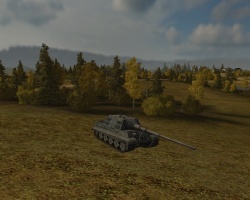 The Jagdtiger leads to the Jagdpanzer E 100. The JT is a relatively one-dimensional tank that uses several facets in pursuit of that. The first and foremost focus of the JT player is one thing: damage. The JT cannot scout and cannot flank other tanks; its role isn't distraction or spotting. Its role is to simply hammer away at the foes' hitpoints, one shell at a time. Compared to many TDs at these tiers, the JT seems to be a less damaging tank, what with its 490 (later 560) damage-per-shot rating, when many other tier IX (and especially tier X) TDs are doing 750 or more. However, it is easy to forget that for all the awesome power the 150mm+ class guns have, there is a cost to such damage: long reload cycles. So long, it should be noted, that most large guns don't have any real suppressive power: they take a shot and, regardless of results they are open and vulnerable for enough time for a medium or a group of tanks to push up and focus fire them without any recourse. The JT on the other hand excels at punishing a foe when they make the attempt to push forward. With the shorter reload of the 128mm gun the JT is capable of running sustained fire on targets in the open, and doing so allows it to rake in more damage overall than the single-shot cannons while simply being a more flexible weapon. There are some drawbacks to the JT though: the mobility and lack of effective armor. It also has bad camouflague values, so it is not a particularly good idea to rely on it. It should be said that the 250mm casemate plate, mantlet, and 8 degrees of gun depression does make the JT quite good in a hull down position. However, when attempting to relocate to a location, or in the open without cover, the JT is without question vulnerable. If flanked, the large profile makes it easy to track and hit. The armor, outside of the casemate front, doesn't amount to more than 210mm effective, which is less than almost any tier 9 or 10 tank can do anyways. The best way to use the JT is to use situational awareness: pay attention to what everyone in front of you is focused on, make sure that you're not the focus of their attention, and then use that time gap to move from cover to cover. Outside of some hills and small rocks, the JT isn't a terribly good tank for abusing cover, but it still can hope to do more damage than it takes, even if it gets caught in the open 1-on-1, with its damage-per-minute. The most effective JT is either in the second line sniping what forward spotters see, or immediately in front of an opponent, facehugging and annihilating them. 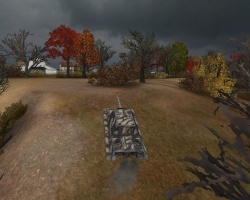 The tank is most comfortable at long or zero range; its weaknesses are more apparent in the midrange game where its weakspots are large enough to be targeted accurately and where it is often easy to be targeted by more than one enemy at once, focus fired, and reduced to flame and ash. Stock suspension can handle both radio and engine (which carries over from the Jagdpanther). Next, the 12,8cm Pak 44/2 L/61 offers much increase in alpha damage and penetration. 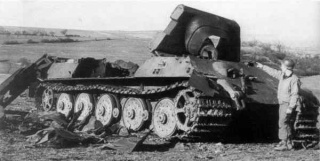 Captured JagdTiger, photo taken by Soviet forces in 1945. Jagdtiger: the common name of a German tank-destroyer (German: Jagdpanzer) of World War II. The official German designation was Panzerjäger Tiger Ausf. B. The ordnance inventory designation was Sd. Kfz. 186. It saw service from late 1944 to the end of the war on both the Western and Eastern Fronts. The Jagdtiger was the heaviest armored fighting vehicle to see service during World War II. Although well protected and armed, it suffered from mechanical problems attributed to its excessive weight. A total of almost 80 vehicles were manufactured. With the success of the StuG III in the tank-destroyer role, the military leadership of Nazi Germany decided to use the chassis' of existing armored fighting vehicles as the basis for self-propelled guns. German tank destroyers of World War II lacked turrets, using fixed casemates instead, and as a result, they were capable of mounting larger caliber guns than on turreted AFVs on the same chassis. The lack of turrets also reduced their production time and cost, as fewer complex components need to be manufactured. In early 1942, a request was made by the Army General Staff to mount a 128 mm gun on a self-propelled armored chassis. On May 18 1942, Adolf Hitler ordered that the 128 mm gun be utilized in the tank-destroyer role, rather than for infantry support. Firing tests of the 128 mm gun showed it to have a high percentage of hits. Lower caliber heavy shells such as the 88 mm and 105 mm were also tested. By early 1943, a decision was made to install a 128 mm gun on a Panther or Tiger I chassis as a heavy assault gun. 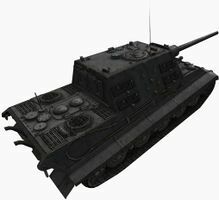 The Panther chassis was considered unsuitable after a wooden mockup of the design was constructed. On October 20 1943, another wooden mockup was constructed on a Tiger II chassis, and presented to Hitler in East Prussia. Two prototypes were produced; a version with the eight road wheel Porsche suspension system (number 305001) and a version with the Henschel nine overlapping-wheel suspension system (number 305002), as used on the production Tiger II, were completed in February 1944. 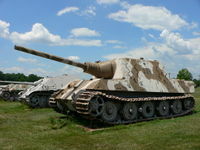 It was originally designated as Jagdpanzer VI, but was later named the Jagdtiger. It received the special ordnance number Sd.Kfz. 186. 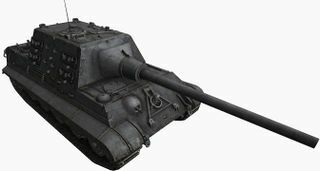 The Jagdtiger was a logical extension of the creation of Jagdpanzer designs from tank designs, such as the Jagdpanther from the Panther tank. The Jagdtiger used a boxy casemate superstructure on top of a lengthened Tiger II chassis. The resulting vehicle featured very-heavy armor and the 128 mm PaK 44 L/55 gun,:capable of defeating any tank fielded in World War II, even at very long ranges (over 3,500 m). It had 250 mm armor on the front of the casemate and 150 mm on the glacis plate. The main gun mount had a limited traverse of only 10 degrees; the entire vehicle had to be turned to aim outside that narrow field of fire. The Jagdtiger suffered from a variety of mechanical and technical problems due to its immense weight and under-powered engine. The vehicle had frequent breakdowns. Ultimately, more Jagdtigers were lost to mechanical problems or lack of fuel than to enemy action. 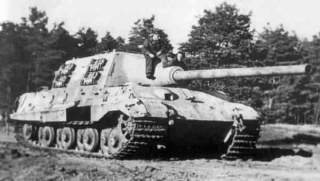 150 Jagdtigers were ordered, but only half that number were produced. Eleven of them, serial numbers 305001 and 305003 to 305012, were produced with the Porsche suspension (8 roadwheels): all following used the Henschel suspension (9 roadwheels). Production figures vary depending on source and other factors, such as if prototypes are included and if those made after VE day are included. Totals range from about 77 to 88 produced from July 1944 to May 1945. Approximately 48 from July 1944 to the end of December 1944, 36 from January to April 1945, and serial numbers from 305001 to 305088 (such as examples from May 1945, and pre-production prototypes, and whether incomplete chassis are counted). Some sources say no more vehicles were completed after February. Towards the end, some were lacking important equipment and could not be used operationally, or could not be deployed to units. Vehicle 305020, [US Army Ordnance Museum]. 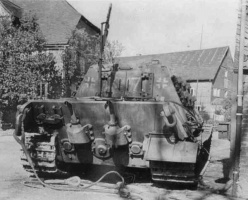 Only two heavy anti-tank battalions (schwere Panzerjäger-Abteilung), numbered 512 and 653, were equipped with Jagdtigers, with the first vehicles reaching the units in September 1944. About twenty percent were lost in combat, most were destroyed by their own crews when abandoned, chiefly due to mechanical breakdowns or lack of fuel in the desperate final stages of the war. The gun used separate-loading ammunition, which meant that two loaders were used to insert the projectile and the cased propelling charge separately. This resulted in a slow rate of fire. The tremendous amount of smoke would often give-away the position of the vehicle, in addition to momentarily blinding the crew, although the latter was a moot point, owing to the very-slow reload time. Tiger ace Otto Carius commanded the second of three companies of Jagdtigers in Panzerjagerabteilung 512. His memoir "Tigers in the Mud" provides a rare combat history of the ten Jagdtigers under his command. 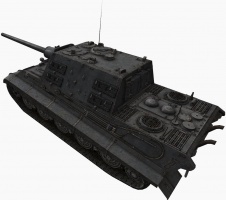 He states that Jagdtigers were not utilized to their full potential due to several factors. Allied air supremacy made it difficult to move, the massive gun needed to be re-calibrated from jarring after traveling off-road for even short distances, it was slow, and transmissions and differentials broke down easily because the whole 72 ton vehicle needed to rotate to traverse. The massive gun had to be locked down, otherwise mounting brackets would have worn too much for accurate firing. However, he also recorded that a 128 mm projectile went through all the walls of a house and destroyed an American tank behind it. Insufficient crew training and depleted morale was the biggest problem for Jagdtiger crews under Carius' command. At the Ruhr pocket, two Jagdtiger commanders failed to attack an American armored column about 1.5 km away in daylight for fear of attracting an air attack, even though Jagdtigers were well-camouflaged. Both vehicles broke down while withdrawing through fear of air attack, and one was then destroyed by the crew. To prevent such a disaster at Siegen, Carius himself dug in on high ground. An approaching American armored column avoided the prepared ambush because German civilians warned them of it. 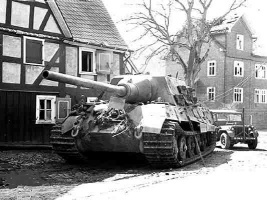 Later, one of his vehicles fell into a bomb crater at night and was disabled, and another was lost to Panzerfaust attack by friendly Volkssturm troops who had never seen a Jagdtiger before. Near Unna, one Jagdtiger attacked uphill against five American tanks six-hundred meters away; two withdrew and the other three opened fire. 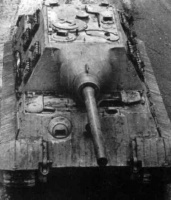 The Jagdtiger took several hits, but they could not penetrate the 250 mm frontal armor. The inexperienced German commander then lost his nerve and turned around instead of backing away, exposing the thinner side armor, which was eventually penetrated and all six crew were lost. 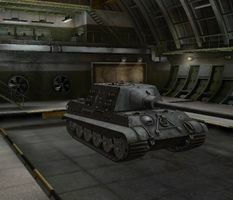 Carius wrote that it was useless when crews were not trained or experienced enough to have the thick frontal armor facing the enemy at all times. When unable to escape the Ruhr pocket, Carius ordered the guns of the remaining Jagdtigers destroyed and surrendered to American forces. The ten Jagdtigers of 2nd Company, Panzerjagerabteilung 512, destroyed one American tank for one Jagdtiger lost to combat, one lost to friendly fire, and eight others lost to breakdown or destroyed by their crews to prevent capture. 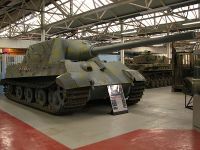 Jagdtiger at Bovington Tank Museum. The top 12,8 cm Pak L/66 gun was never mounted on the Jagdtiger. The 12,8 cm Pak L/66 configuration was merely a proposal by Krupp to extend the Jagdtiger's superstructure in order to fit the gun. Due to the gun's enormous size, it had to be retracted into the rear casemate when the tank is moving. The project was deemed unrealistic and rejected. 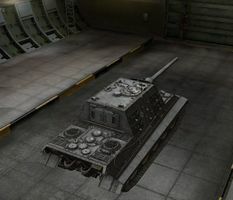 Therefore the Jagdtiger's top configuration as depicted in-game is fictitious. From August 1944, German tanks had a dark yellow base coat. Jagdtigers produced from autumn 1944 had a "light and shadow" camouflage pattern with dark yellow and dark green spots. The base colour was changed to dark green in November 1944. 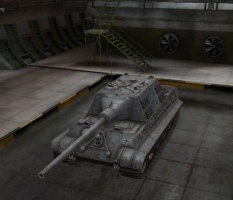 In World of Tanks, however, the Jagdtiger is in early Panzer Grey. This page was last modified on 10 April 2019, at 16:26. This page has been accessed 684,807 times.